Adam Smith FRSA (16 June [O.S. 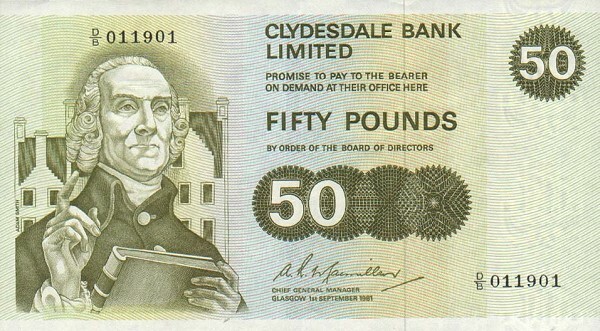 5 June] 1723 – 17 July 1790) was a Scottish economist, philosopher and author as well as a moral philosopher, a pioneer of political economy and a key figure during the Scottish Enlightenment. Smith is best known for two classic works, The Theory of Moral Sentiments (1759) and An Inquiry into the Nature and Causes of the Wealth of Nations (1776). The latter, usually abbreviated as The Wealth of Nations, is considered his magnum opus and the first modern work of economics. Smith studied social philosophy at the University of Glasgow and at Balliol College, Oxford, where he was one of the first students to benefit from scholarships set up by fellow Scot John Snell. After graduating, he delivered a successful series of public lectures at Edinburgh, leading him to collaborate with David Hume during the Scottish Enlightenment. Smith obtained a professorship at Glasgow, teaching moral philosophy and during this time wrote and published The Theory of Moral Sentiments. In his later life, he took a tutoring position that allowed him to travel throughout Europe, where he met other intellectual leaders of his day. In 1762, the University of Glasgow conferred on Smith the title of doctor of laws (LL.D.). At the end of 1763, he obtained an offer from Charles Townshend—who had been introduced to Smith by David Hume—to tutor his stepson, Henry Scott, the young Duke of Buccleuch. Smith then resigned from his professorship to take the tutoring position. He subsequently attempted to return the fees he had collected from his students because he had resigned partway through the term, but his students refused. From Geneva, the party moved to Paris. Here, Smith came to know several great intellectual leaders of the time, invariably having an effect on his future works. This list included: Benjamin Franklin, Turgot, Jean D'Alembert, André Morellet, Helvétius, and notably, François Quesnay, the head of the Physiocratic school. Smith was so impressed with his ideas that he might have dedicated The Wealth of Nations to Quesnay had he not died beforehand. Physiocrats were opposed to mercantilism, the dominating economic theory of the time. Illustrated in their motto Laissez faire et laissez passer, le monde va de lui même! (Let do and let pass, the world goes on by itself!). They were also known to have declared that only agricultural activity produced real wealth; merchants and industrialists (manufacturers) did not. However, this did not represent their true school of thought, but was a mere "smoke screen" manufactured to hide their actual criticisms of the nobility and church, arguing that they made up the only real clients of merchants. In 1766, Henry Scott's younger brother died in Paris, and Smith's tour as a tutor ended shortly thereafter. Smith returned home that year to Kirkcaldy, and he devoted much of the next 10 years to his magnum opus. There, he befriended Henry Moyes, a young blind man who showed precocious aptitude. Smith secured the patronage of David Hume and Thomas Reid in the young man's education. In May 1773, Smith was elected fellow of the Royal Society of London, and was elected a member of the Literary Club in 1775. The Wealth of Nations was published in 1776 and was an instant success, selling out its first edition in only six months. Smith's library went by his will to David Douglas, Lord Reston (son of his cousin Colonel Robert Douglas of Strathendry, Fife), who lived with Smith. It was eventually divided between his two surviving children, Cecilia Margaret (Mrs. Cunningham) and David Anne (Mrs. Bannerman). On the death of her husband, the Reverend W. B. Cunningham of Prestonpans in 1878, Mrs. Cunningham sold some of the books. The remainder passed to her son, Professor Robert Oliver Cunningham of Queen's College, Belfast, who presented a part to the library of Queen's College. After his death, the remaining books were sold. On the death of Mrs. Bannerman in 1879, her portion of the library went intact to the New College (of the Free Church) in Edinburgh and the collection was transferred to the University of Edinburgh Main Library in 1972. James Boswell, who was a student of Smith's at Glasgow University, and later knew him at the Literary Club, says that Smith thought that speaking about his ideas in conversation might reduce the sale of his books, so his conversation was unimpressive. According to Boswell, he once told Sir Joshua Reynolds, that 'he made it a rule when in company never to talk of what he understood'. Smith has been alternately described as someone who "had a large nose, bulging eyes, a protruding lower lip, a nervous twitch, and a speech impediment" and one whose "countenance was manly and agreeable." Smith is said to have acknowledged his looks at one point, saying, "I am a beau in nothing but my books." Smith rarely sat for portraits, so almost all depictions of him created during his lifetime were drawn from memory. The best-known portraits of Smith are the profile by James Tassie and two etchings by John Kay. The line engravings produced for the covers of 19th-century reprints of The Wealth of Nations were based largely on Tassie's medallion. In 1759, Smith published his first work, The Theory of Moral Sentiments, sold by co-publishers Andrew Millar of London and Alexander Kincaid of Edinburgh. Smith continued making extensive revisions to the book until his death. [N 2] Although The Wealth of Nations is widely regarded as Smith's most influential work, Smith himself is believed to have considered The Theory of Moral Sentiments to be a superior work. Smith's most prominent disciple in 19th-century Britain, peace advocate Richard Cobden, preferred the first proposal. Cobden would lead the Anti-Corn Law League in overturning the Corn Laws in 1846, shifting Britain to a policy of free trade and empire "on the cheap" for decades to come. This hands-off approach toward the British Empire would become known as Cobdenism or the Manchester School. By the turn of the century, however, advocates of Smith's second proposal such as Joseph Shield Nicholson would become ever more vocal in opposing Cobdenism, calling instead for imperial federation. As Marc-William Palen notes: "On the one hand, Adam Smith’s late nineteenth and early twentieth-century Cobdenite adherents used his theories to argue for gradual imperial devolution and empire ‘on the cheap’. On the other, various proponents of imperial federation throughout the British World sought to use Smith’s theories to overturn the predominant Cobdenite hands-off imperial approach and instead, with a firm grip, bring the empire closer than ever before." Smith's ideas thus played an important part in subsequent debates over the British Empire. ↑ In Life of Adam Smith, Rae writes: "In his fourth year, while on a visit to his grandfather's house at Strathendry on the banks of the Leven, [Smith] was stolen by a passing band of gypsies, and for a time could not be found. But presently a gentleman arrived who had met a gypsy woman a few miles down the road carrying a child that was crying piteously. Scouts were immediately dispatched in the direction indicated, and they came upon the woman in Leslie wood. As soon as she saw them she threw her burden down and escaped, and the child was brought back to his mother. [Smith] would have made, I fear, a poor gypsy." ↑ The 6 editions of The Theory of Moral Sentiments were published in 1759, 1761, 1767, 1774, 1781, and 1790, respectively. ↑ "Adam Smith (1723-1790)". BBC. Adam Smith's exact date of birth is unknown, but he was baptised on 5 June 1723. 1 2 "100 Best Scottish Books, Adam Smith". Retrieved 31 January 2012. ↑ Smith, A., 1976, The Wealth of Nations edited by R. H. Campbell and A. S. Skinner, The Glasgow edition of the Works and Correspondence of Adam Smith, vol. 2b, p. 678. ↑ Durant, Will; Durant, Ariel (1 July 1967). The Story of Civilization: Rousseau and Revolution. MJF Books. ISBN 1567310214. ↑ Bonar, James, ed. (1894). "Adam Smith's Will". A Catalogue of the Library of Adam Smith. London: Macmillan. pp. XIV. OCLC 2320634. Retrieved 13 May 2018 – via Internet Archive}. ↑ Boswell's 'Life of Samuel Johnson, 1780. ↑ Hill, L. (2001). "The hidden theology of Adam Smith". The European Journal of the History of Economic Thought. 8: 1–29. doi:10.1080/713765225. ↑ Eric Schliesser (2003). "The Obituary of a Vain Philosopher: Adam Smith's Reflections on Hume's Life" (PDF). Hume Studies. 29 (2): 327–62. ↑ "Andrew Millar Project, University of Edinburgh". millar-project.ed.ac.uk. Retrieved 3 June 2016. ↑ Adam Smith, Glasgow Edition of the Works and Correspondence Vol. 1 The Theory of Moral Sentiments . ↑ Ekelund, R. & Hebert, R. 2007, A History of Economic Theory and Method 5th Edition. Waveland Press, United States, p. 105. ↑ Smith, A., 1976, The Glasgow edition of the Works and Correspondence of Adam Smith, vol. 1, pp. 184–85, edited by D. D. Raphael and A. L. Macfie, Oxford: Clarendon Press. ↑ Smith, A., 1976, The Glasgow edition, vol. 2a, pp. 26–27. ↑ Smith, A., 1976, The Glasgow edition, vol. 2a, pp. 145, 158. ↑ "Adam Smith – Jonathan Swift". University of Winchester. Archived from the original on 28 November 2009. Retrieved 11 February 2010. ↑ Stigler, George J. (1976). "The Successes and Failures of Professor Smith," Journal of Political Economy, 84(6), pp. 1199–213, 1202. Also published as Selected Papers, No. 50 (PDF), Graduate School of Business, University of Chicago. ↑ Samuelson, Paul A. (1977). "A Modern Theorist's Vindication of Adam Smith," American Economic Review, 67(1), p. 42. Reprinted in J.C. Wood, ed., Adam Smith: Critical Assessments, pp. 498–509. Preview. ↑ Clark, B. (1998). Political-economy: A comparative approach, 2nd ed., Westport, CT: Praeger. p. 32. ↑ Marc-William Palen, “Adam Smith as Advocate of Empire, c. 1870–1932,” Historical Journal 57: 1 (March 2014): 179–98. ↑ "Smith replaces Elgar on £20 note". BBC. 29 October 2006. Archived from the original on 24 March 2007. Retrieved 14 May 2008. ↑ "The restoration of Panmure House". Archived from the original on 22 January 2012. ↑ "Adam Smith: Web Junkie". Forbes. 5 July 2007. Archived from the original on 20 May 2008. Retrieved 10 June 2008. ↑ Brown, Vivienne; Pack, Spencer J.; Werhane, Patricia H. (January 1993). "Untitled review of 'Capitalism as a Moral System: Adam Smith's Critique of the Free Market Economy' and 'Adam Smith and his Legacy for Modern Capitalism'". The Economic Journal. 103 (416): 230–32. doi:10.2307/2234351. JSTOR 2234351. ↑ Viner, Jacob (April 1927). "Adam Smith and Laissez-faire". The Journal of Political Economy. 35 (2): 198–232. doi:10.1086/253837. JSTOR 1823421. ↑ Klein, Daniel B. (2008). "Toward a Public and Professional Identity for Our Economics". Econ Journal Watch. 5 (3): 358–72. ↑ Klein, Daniel B. (2009). "Desperately Seeking Smithians: Responses to the Questionnaire about Building an Identity". Econ Journal Watch. 6 (1): 113–80. 1 2 Buchholz, Todd (December 1990). pp. 38–39. Smith, Adam (1982) . D. D. Raphael and A.L. Macfie, ed. The Theory of Moral Sentiments. Liberty Fund. ISBN 0-86597-012-2.